It's time to be seen. A robust violin case with a twist. The silver rocket violin case from Sinfonica offers complete protection for your instrument, while offering a unique style. Available in a range of lively colours, there's a Rocket case to suit your personality. A lot of modern violins come supplied in either an oblong or contoured case. Although these offer good protection, they can often be boring and lifeless to look at. All Sinfonica Rocket cases boast a modern shape combined with a bright glossy finish, enabling you to stand out from the crowd. 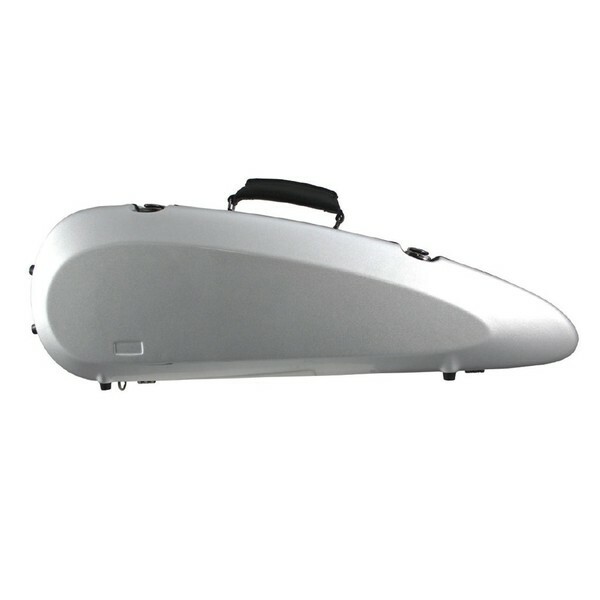 The shell of the case is moulded from fibreglass which is rigid and lightweight - perfect for the commuting musician. To ensure the finish of your violin is cared for, the Rocket case is lined with velvet effect padding to keep your instrument looking its best. The Rocket case from Sinfonica offers everything you want from a violin case. Thanks to the lightweight fibreglass body, travelling couldn't be easier. And once you attach the padded shoulder strap, you'll forget you're even carrying it. The interior of the case comes complete with a bow holder and storage compartment to store all your essential accessories. Your violin will be housed in a padded velvet effect body, which when combined with the matching blanket, offers fantastic protection for the finish of your instrument.